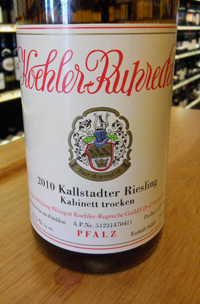 2010 Koehler Ruprecht, Riesling Kabinett Trocken Kallstradter, Pfalz Germany. I was really excited to try the Koehler Ruprecht Pfalz Trocken, and sadly I blew up the first bottle in my freezer, so after scraping Riesling ice from my refrigerator I had to postpone this review until the second bottle was more carefully chilled, and while I felt bad for my Riesling abuse, I am happy to report the Koehler Ruprecht was worth the wait. The 2010 vintage was a vintage of high acidity and rather difficult in Germany, but artisans found a way to craft some intriguing wines and Koehler Ruprecht even made some nice Trockens, in keeping with their house style. The 2010 Kallstradter Kabinett Trocken is shackling dry and brisk to start with severe lime and kumquat notes with loads of tangy acid and lip smacking crispness, though more interesting layers unfold in the glass with a core of mineral and chalk flowing throughout. Cooly steely to the core this refreshing Riesling builds a bit with air showing white peach, extract and grapefruit seeds with hints of white flowers and tangerine. This wine is very unique and very austere, leaving me wonder if that is it’s Kallstradter terroir coming through or if the native yeast gives it this character or what? All in all this is a well made and serious Riesling that while not overly easy to love, time will be needed and or food to bring out it’s more charming side, though Riesling Acid Freeks with really dig this in the short term, I will try a few more bottles in and over time to give my final blessings as it is sort of a beast at the moment I have high hopes. 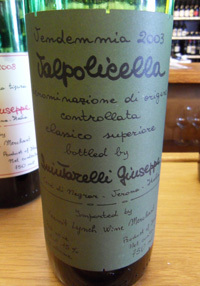 2003 Giuseppe Quintarelli, Valpolicella Classico Superiore, red Veneto Italy. Wildly expensive, funky and crazy good are what my first draft of notes said of this wonderfully unique wine from the famed house of Quintarelli. The late great Giuseppe Quintarelli was a revolutionary winemaker and thinker, he changed what meant and was to be an Amarone and Valpolicella, crafting amazingly complex wines and defining what top wines could and should be, also his wines can be remarkably long lived. His passing was certainly felt, especially in his beloved region where he schooled many aspiring winemaker, including Romano Dal Forno, but his legacy lives on and these new releases prove the family is continuing his pursuit of excellence and will carry on with his inspiration and passion. The 2003 Valpolicella Classico Superiore is an edgy red, slightly affected by volatile acidity and classic weirdness, but once settled in the glass everything comes together and things get interesting and the texture is amazing in this Corvina based Valpolicella, though it has other local varietals, plus some Cabernet(s) in the mix here as well. Dusty chocolate, golden raisin, poached plum, reduced cherry and minty herbs all combine to seduce the palate along with strawberry, blonde tobacco, fig paste, truffle and cedar. So much is going on your head spins, but if you manage to calm yourself, you’ll just smile with happy pleasure and marvel at this treasure. There is a touch of candied citrus rind and saline that add mouthwatering savory tang reminding you to enjoy this Valpolicella with food, maybe lamb or cheese at least. Be sure to let this wine air out a bit and hold on for the wild ride. 2011 Peay Vineyards, Pinot Noir “Pomarium” Estate, Sonoma Coast. Doomsayers of the 2011 vintage will have to eat crow, especially after tasting this majestic Pinot Noir from Vanessa Wong and the Peay brothers, Nick and Andy, I was very impressed to say the least with the latest wines from Peay and this Pomarium Pinot is truly wonderful and sublimely crafted. The nose is tangy with cranberry, floral tones and mineral essences with a touch of classy oak toast leading to a vigorous palate of fresh strawberry, cherry and fruit cup with hints of tea and pepper spices, chalky stones and hints of herb, vanilla and briar. This wine fills out in the glass and coats the palate with air with rich detail and nice depth plus length. This is pure class and exciting, and for those that like Burgundy will find much to admire here, while California fans will discover a wine of fantastic pleasure and a wine that shows true terroir, bravo, this is beautiful Pinot Noir in every sense. Look forward to a decade of intriguing drinking from this gem. I couldn’t pass up this opportunity to comment on a day in the life of a wine taster/critic/buyer/enthusiast, especially after tasting such an amazing array of wines from around the world and close to home. I also had to protest a recent blog post I read from a renown wine critic for a major magazine who said pretty much that he couldn’t find a worthy wine from from the difficult 2011 vintage in Northern California, this I thought was a huge broad statement of which was totally false and harmful to a huge number of people, not only hard working winemakers and growers, but to his own readership! While the vintage was not going to go down as the best of years and it was very trying to everyone involved to get good fruit and to make great wines, there are many huge successes and there are so amazing and lovely wines coming out, so don’t fear it, explore it and cherish the extra hard work it took to get there, and while there are going to be some watery and sad wines, as there is every year, the top producers and artisan wineries did many fine efforts. This is a chance to see their talents and terrors shine through, the cream does rise to the top in these conditions, and they deserve better than be painted by reckless broad brush strokes into one heap, if fact 2011 is a remarkable vintage for the emerging wine lover to relish. Now to the wines themselves, the latest set of Peay Vineyards wines are fantastic and they released a new single vineyard Pinot from Savoy vineyard in Anderson Valley that shows graceful detail and elegance with glorious balance and texture, and guess what, it is a 2011, plus Peay is again a top source for fun rose with their Cep Rose of Pinot Noir 2012 which is so good I want to cuddle up with it all summer! Also it is release time at Ridge Vineyards as well, and you shouldn’t pass up a chance to grab their wonderful 2010 Merlot from their Monte Bello estate vines in the Santa Cruz Mountains, it has a true Pomerol character, but remains a true California wine, and the new 2010 Cabernet, the baby Monte Bello is another fine effort, though I should think another year in bottle with give it time to fill out and come together, it has nice potential no question. The Ridge 2011 Zins are lighter and very zippy, even though some might want a touch more ripeness they should be pleasing wines to quaff young. Kermit Lynch Imports is releasing the famed Quintarelli wines soon, and for those that didn’t know, Quintarelli is one of the most iconic Italian producers are the late Giuseppe Quintarelli was the heroic figure that brought Amarone to unheard of heights and inspired hundreds of winemakers in the region, including the fabled Romano Dal Forno, and Quintarelli’s family now continues to produce some of the most unique wines in the world. These new releases, which I just tasted are everything they has always been and future looks secure for this estate and we are graced with the next generation of these classics. I sampled the following treasures: Quintarelli Bianco, a dry cuvee from the 2011 vintage, Primofiore red 2008, a suburb classy wine with Corvina, Cab Franc and Cabernet Sauvignon mainly, Rosso Ca’ de Merlo a single vineyard ripasso Valpolicella style red 2003, A 2003 Valpolicella Classico Superiore that I thought was amazing and wild, a personal favorite, and finally the Recioto della Valpolicella 2001 which is a more than slightly sweet red that is remarkably textured in a way that showcases the heart of Quintarelli style. Without question this was an eye opener, especially for me, as I’ve not had a chance in the past to try many of these legendary wines, but from what I tasted, Quintarelli fans will be very happy indeed to find these wines available again in the USA! Lastly, I got a chance to taste some unique Loire Valley reds, a set of all natural blends and a Pinot Noir, all of which were a touch funky, but interesting and fun, of which I will follow up with full notes soon. Plus, there was a set of 2008 Baroli from Bovio, all of which were powerful, tight and promising for the future, and again my notes will follow. So, all in all a special day ended with an unbelievable collection of thoughts and I can hardly handle the sensory overload, making it difficult to focus on a single tasting note! Happy Easter to you all. 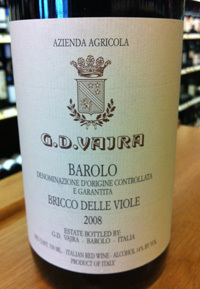 2008 G.D. Vajra, Barolo DOCG “Bricco Delle Viole” Piedmonte, Italy. This wine is utterly spellbinding and mesmerizing with purity and drive that harnesses the absolute best qualities of the Nebbiolo grape and in doing so makes for one of the greatest Barolo experiences I’ve ever had, right up there with the finest such as Giacosa, Gaja, La Spinetta Campe and Vietti. From top to bottom, the last few vintages of G.D. Vajra have been nearly flawless and amazingly detailed, and the pinnacle of their efforts is this Bricco Delle Viole Barolo, a wine from a slightly better than average vintage, this Barolo is a masterpiece in every way imaginable. I was lucky to have been able to sample this one from a pre release sample along side their 2007, no slouch either, and I was completely blown away, in fact a colleague saw my expression and remarked he had the same exact reaction, totally and completely shocked by the remarkable perfection of this wine. The nose is haunting with wilted roses, dried violets, grilled herbs, truffle and liqueur notes with liquified strawberry, black cherry, poached plum and melted black licorice all flowing from bouquet to finish. There is a detailed delicacy to go with the hidden power and verve that sets this Barolo apart and there is a lovely mineral streak and both the acidity and tannin are presented in a elegant fashion, you know they are there, but everything is refined and smooth without losing the life and lift here. Sometimes words fail, fail completely to convey the completeness and pleasure, and this is one of those occasions, I can only say I hope you get a chance to try this truly brilliant Barolo. It is without question one of the years best wines, and it has about a decade to be at it’s best, but I would have a terrible time waiting it out. 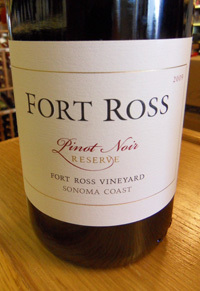 2009 Fort Ross, Pinot Noir Reserve, Fort Ross Vineyard, Sonoma Coast. Fort Ross is an impressive small winery in California’s newest AVA, Fort Ross-Sea View in the wilds of the greater Sonoma Coast, very close to the ocean and an area that is a hot bed of excitement, especially for severely cool climate Pinot Noir, with Failla and Hirsch just up the road and a host of other fantastic sites very close by. Jeff Pisoni (Pisoni Vineyards), Fort Ross’ winemaker has taken these wines to the next level and his artisan touch has brought much critical acclaim as well, his wines from 2009, 2010 and the latest 2011 show great potential and his talent no question. This 2009 Reserve Pinot, Jeff’s first complete wine from the estate is magic, a stunning example of terroir driven wine and a tour de force of character, style and pleasure in California Pinot Noir. The nose has violets, earth and warm toasty oak notes along with black currants and kirsch leading to a vigorous and seductive palate of silky richness with black cherry, plum and mocha notes along with hints of mineral and red spices with touches of cola bean, vanilla and framboise that linger on and on. This wine is lively and focused with great freshness holding the flamboyant fruit in balance, and while stellar now it should drink great for another 5 years easy. 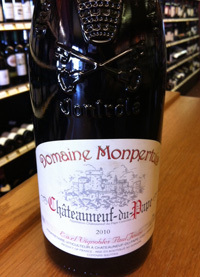 2010 Domaine Monpertuis, Chateuneuf du Pape Rouge, Rhone Valley, France. This is a thrilling Chateauneuf that has intensity and charm with texture, vibrancy and length. Without a doubt this is quality and value, highlighting one of the best vintages since 1990 or 1998 in Chateauneuf and while the Cotes du Rhones at $15 or so are a bit more friendly on the wallet, it truly revels the extra class that Chateauneuf du Pape’s can give and I think it should get even better with another 5 to 10 years in bottle. Very youthful and explosive, the Monpertuis leads with dried flowers, earthy truffle, lavender and anise along with boysenberry, plum, pomegranate and kirsch while cassis, coco and peppery spices come through mid palate and the lengthy finish has umami and mineral notes, but the over all lingering pleasure is one of hedonistic fruit. This wine has some filling out to come, but certainly it is a complete effort and should be a great cellar find in a decade or so. 2011 Dr. 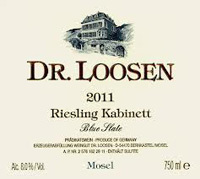 Loosen, Riesling Kabinett “Blue Slate” Mosel, Germany. While commonly found, the Loosen wines are still good go to Rieslings in every price class, and this 2011 Blue Slate Kabinett is especially delicious and vivid with great refreshment qualities and very enjoyable. This Mosel shows hints of tropical fruits, green apple and lemon/lime while savory mineral and saline notes keep your mouthwatering and the touch of sweetness balances the zesty acidity. This is one of the best Dr. Loosen Kabinett level wines I’ve tried in the last few vintages and there should be plenty around still to stock up on. I love Riesling with anything, smoked meats, pate, cheeses, Asian dishes and more, and this style goes well with everything and is perfect refreshment on a warm summer day as well. The 2011 Loosen Blue Slate Kabinett is a big step up from the QbA, and while not as unique or interesting as some of the smaller estates, it is a very pleasing Riesling that can be drunk now or held for a few more years as well. 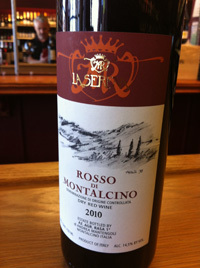 2010 La Serena, Rosso di Montalcino DOC, Tuscany, Italy. This delicious Tuscan red delivers big flavors and rich texture and highlights the quality of the vintage in this famous region. La Serena’s baby Brunello is lush with red cherry, raspberry, currant and plum fruits, sweet blonde tobacco, chocolate, tangy herbs and licorice root notes. 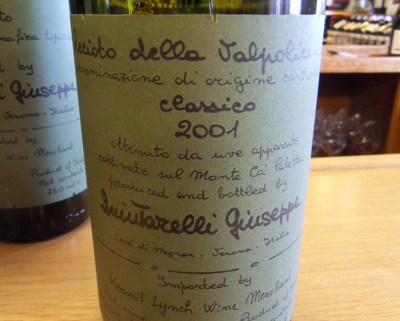 Pure Sangiovese Grosso at it’s finest and with youthful charms and energy that are seductive and vibrant. There is some fine tannins and zesty acidity to liven things up and hold focus in this lovely and interesting wine to enjoy now and for the next few years. This La Serena is a perfect companion for many dishes from pizza to lamb and can just be enjoyed on it’s own, if you are in the mood for Tuscany this is a great pick. 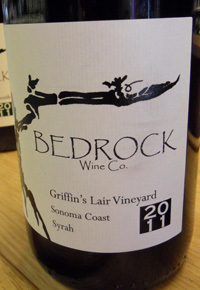 2011 Bedrock, Syrah “Griffin’s Lair Vineyard” Sonoma Coast. Another don’t miss wine from Bedrock, the 2011 Griffin’s Lair, a beautiful Northern Rhone style Syrah with heady aromatics, vivid blue and black fruits, nice mineral tones and just enough savory/earthy notes. This wine is a stunner through and through, starting with violets, white pepper and black currants leading to a medium weight palate of blueberry, boysenberry and tangy cherry while crushed stones, truffle, pepper and anise add complexity to this very fine Syrah. These was about 10% Viognier added, making this Cote-Rotie style wine shine with purple hues and lifted perfume and flavors. This focused, fresh and vibrant wine should fill out over the next year, but I just adore it’s youthful charms now even, this is super and should drink nicely for the next 3-5 years.